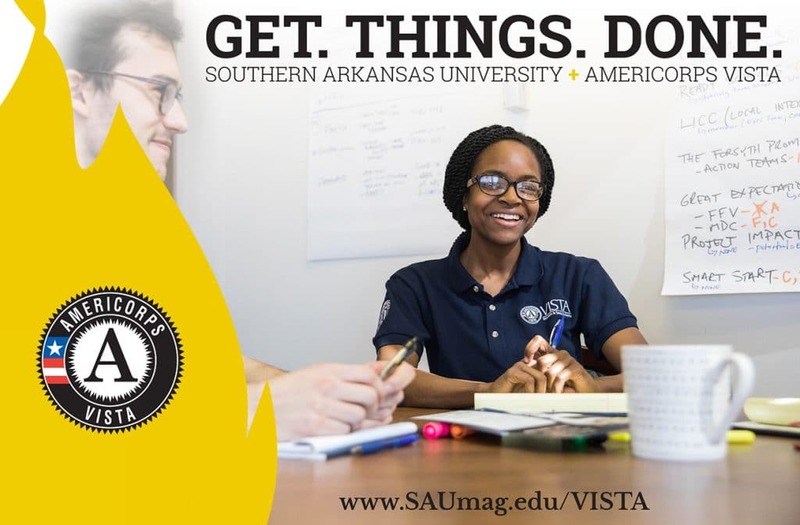 An AmeriCorps VISTA program is being established at Southern Arkansas University toward the goal of poverty alleviation through college degree completion courtesy of $250,000 in grant support from the Corporation for National & Community Service (CNCS). The SAU+VISTA (Volunteers in Service to America) program will consist of 8 VISTA members and 22 VISTA Summer Associates. VISTA members serve full-time for a period of 12 months assisting organizations that help eradicate poverty. The AmeriCorps VISTA Summer Associates program offers the opportunity to become engaged in a community through a VISTA project for a period of 8 to 10 weeks during the summer. SAU’s VISTA application acceptance letter was received on February 28 from the Arkansas CNCS state office. The Summer Associate hiring process will require a quick turnaround. Anyone interested in finding out more or applying can visit the SAU+VISTA website at www.SAUmag.edu/VISTA, which provides information about SAU+VISTA, as well as hiring descriptions and links to the online applications for the Summer Associates and SAU+VISTA member positions. The 22 SAU+VISTA Summer Associates will serve for a period of 10 weeks toward direct program needs and to build capacity by preparing and delivering programs targeted toward facilitating college enrollment and increasing college completion for current and future SAU students. The summer service term is May 20 through July 28, and online application submissions opened April 3, 2019. With such a large portion of our student body having low-income families of origin, there is a strong, logical tie between VISTA’s anti-poverty focus and our student retention focus,” said SAU’s First Lady and Senior Advisor for Institutional Advancement Dr. Katherine Simms Berry, who initiated and developed the SAU+VISTA proposal and will serve as SAU+VISTA director. A 12-member VISTA Advisory Group will directly oversee the areas related to VISTA members and their service activities and performance measures. VISTA members at SAU will be called VISTA Fellows “as an elevation of the volunteer beyond our usual volunteer status,” said Berry. The term “fellow” will also distinguish the full-time, year-long VISTAs from VISTA Summer Associates. A VISTA Fellow team leader (requires a minimum of one year of previous service as an AmeriCorps VISTA member) will also help provide volunteer support. A variety of strong skills will be needed among the VISTA Fellows to achieve the capacity-building activities planned under SAU’s program. Common characteristics for all SAU+VISTA Fellows include personal experience in poverty or an understanding of poverty, compassion for students who struggle to complete college, excellent written and verbal communication, a capacity for assessment and evaluation of self and work, leadership experience and potential, and a personal and unique vision for how VISTA is an appropriate place of service for each of them individually. SAU+VISTA Fellows will begin their year-long service term on August 5, 2019. Applications for these positions also opened on April 3. AmeriCorps is a program of the Corporation for National and Community Service (CNCS), the federal agency for volunteering, service, and civic engagement. CNCS engages millions of Americans in citizen service through its AmeriCorps and Senior Corps programs and leads the nation’s volunteer and service efforts. For more information, visit www.nationalservice.gov.